The leading provider of award-winning wireless multi-room music systems, Sonos has finally made their Sonos Controller free application available for Android platform, in addition to app which currently supports Mac, PC, iPhone and iPad. 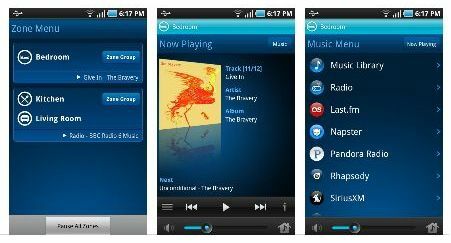 The free Sonos Android app allows the users to wirelessly and easily control music across the home anyway they like right on their Android smartphones. In conjunction with the launch of Sonos Controller for Android, Sonos also has added support for Apple AirPlay in its latest Sonos System Software Update version 3.4. Sonos Controller for Android application (4.6MB) that compatible with Android 2.1+ based mobile devices with a screen size of HVGA (320 x 480 pixels), WVGA (480 x 800 pixels) or WVGA (480 x 854 pixels) resolution is now available as a free download from the Android Market.